In Excel 2016 you can use the View Side by Side command button (the one with the picture of two sheets side by side like tiny tablets of the Ten Commandments) on the Ribbon’s View tab to quickly and easily do a side-by-side comparison of any two worksheet windows that you have open. When you click this button (or press Alt+WB after opening two windows), Excel automatically tiles them horizontally (as though you had selected the Horizontal option in the Arrange Windows dialog box), as shown here. 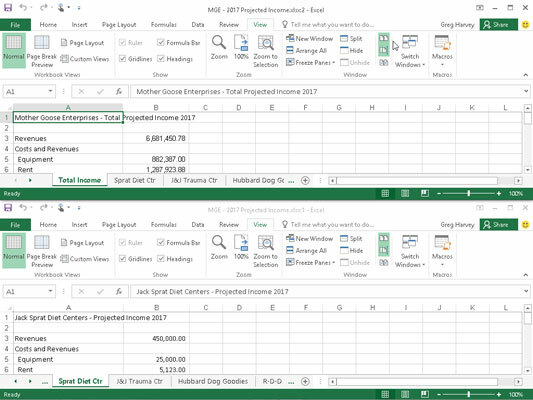 Comparing two worksheet windows side by side. If you have more than two windows open at the time you click the View Side by Side command button (Alt+WB), Excel opens the Compare Side by Side dialog box where you click the name of the window that you want to compare with the one that’s active at the time you choose the command. As soon as you click OK in the Compare Side by Side dialog box, Excel horizontally tiles the active window above the one you just selected. Synchronous Scrolling: When this command button is selected (as it is by default), any scrolling that you do in the worksheet in the active window is mirrored and synchronized in the worksheet in the inactive window beneath it. To be able to scroll the worksheet in the active window independently of the inactive window, click the Synchronous Scrolling button to deselect it. Reset Window Position: Click this command button after you manually resize the active window (by dragging its size box or an edge of the window) to restore the two windows to their previous side-by-side arrangement.